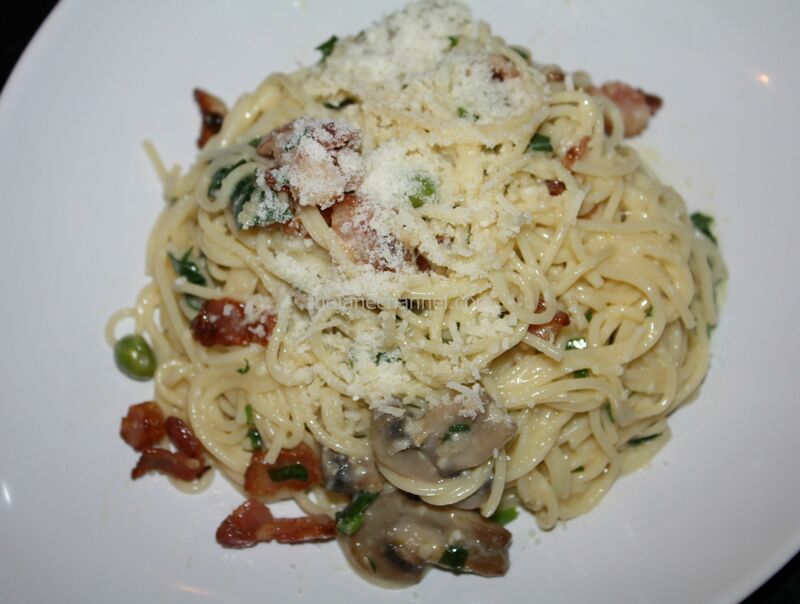 There are many different versions of Spaghetti Carbonara recipes online and I was glad to find that the traditional version doesn’t use creme. It’s lighter and the sauce is just the right amount and consistency so that it sticks to the pasta; the last thing you want with this dish is pasta swimming in too much sauce. The fresh parsley, melting cheese, egg, and wine combine to create flavors that are just the right amount of richness without being too overpowering. This is a recipe that was adapted from the Cooking Light Magazine, with slight changes. I adjusted the serving size and used half a box of spaghetti instead of one box. 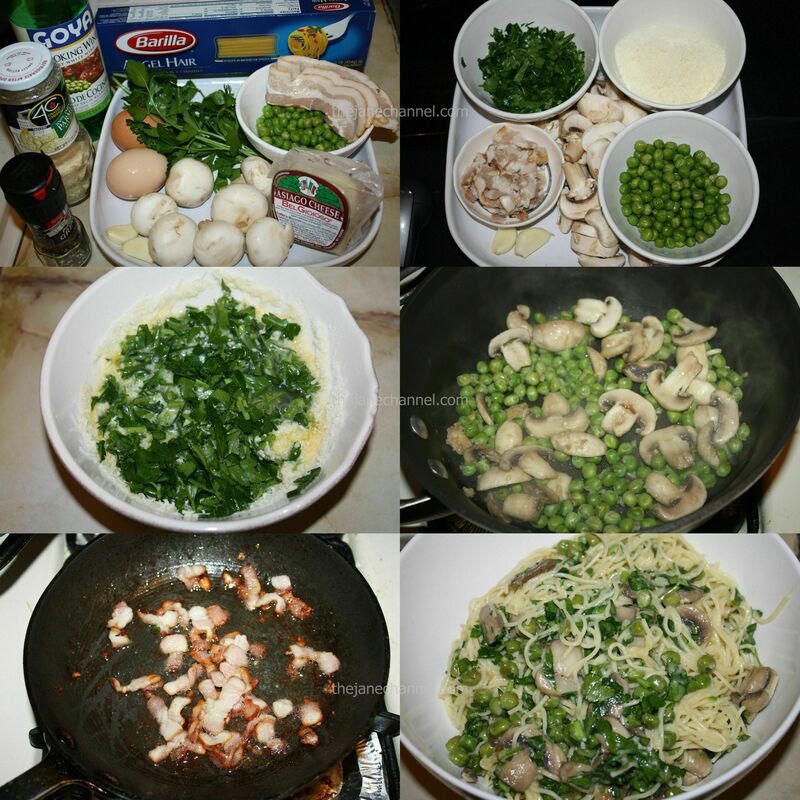 Also, I added peas and mushrooms as I thought that the peas add a bit of color and mushrooms pair well with the dish. In a large bowl, crack the eggs and beat lightly. Add parsley and 1/2 cup of the grated cheese to the eggs. Heat oil in a skillet over high heat. Stir in garlic and cook until fragrant. Add mushrooms and frozen peas. Add wine and cook until liquid is reduced by half. Remove from heat and set aside. In a saucepan over high heat. Add bacon and cook until it is brown. Remove and set aside. Bring a large pot of water to boil, add salt and spaghetti. Cook for 4-5 minutes or follow instructions on the box. Drain well and immediately pour pasta into bowl with egg mixture. Mix well. 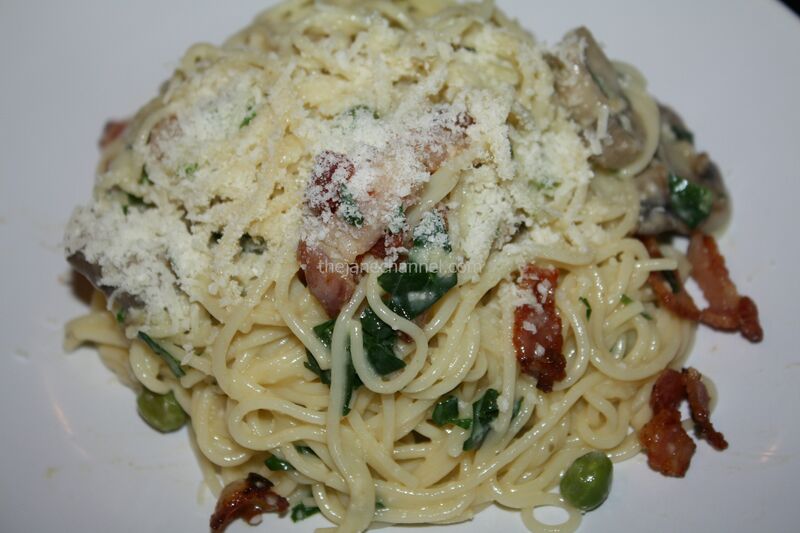 Pour the mushrooms, peas and bacon on top of pasta and combine throughly. Sprinkle with remaining cheese and pepper to taste.